Troy Ryan has landed his first recruit and it looks like a dandy. 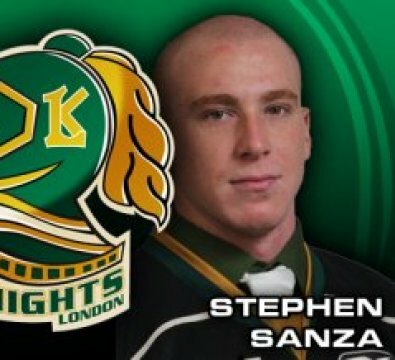 STU has added London Knights' captain and right winger Stephen Sanza to the fold for 2011-2012. This is the fourth player added to the Tommies roster for next season. Sebastien Bernier, Chris Morehouse, and Felix-Antoine Poulin were announced before Ryan was hired as coach. Sanza was named captain of the Knights late in the 2010-11 OHL season after Michael D'Orazio - then captain for London - was traded to Mississauga. Coach Dale Hunter commented "Stevie’s definitely our leader. He’s good with the young kids and he’ll do a good job wearing the ‘C’ for us. He blocks shots, he penalty kills. He’s got 24 goals and plays against the other team’s best line. He does all the things a leader does.” Hunter had given Sanza one the team's assistant jobs at the start of the season. With 44 points this past year in the OHL, Sanza has shown improvement every time he takes a jump to a higher level. Look for him to be a major contributor to Tommies success in the near future. *NEW* Shannon Wise Interview with Stephen Sanza CJBK London. Daily Gleaner - "Tommies bring in two OHL recruits"
London Free Press - "'C' gives Sanza license to talk even more"
London Knights - "Knights name Sanza team captain"
London Free Press - "Joining Knight's Sanza's dream"